Tim Peterson | LightHawk Utah's Red Canyon near Bears Ears National Monument was once a busy uranium mining district, but has fallen silent in the face of low commodity prices even as the BLM authorized a major expansion of the idled Daneros Mine located in Bullseye Canyon, pictured in the middle distance of this aerial photograph. The Trump administration is now considering a petition from the mine's owner, Energy Fuels Resources, to require the nuclear power industry to buy at least 25 percent of its uranium from domestic sources in the hopes of raising prices and breathing life into the uranium industry centered in northern Arizona and southeast Utah. Global markets are awash with cheap uranium, threatening to put out of business U.S. producers who say they are competing against “state-sponsored” companies in Russia’s orbit bent on cornering the market for a critical fuel that powers a fifth of U.S. electrical generation and the nation’s nuclear Navy. In the coming three months, however, President Donald Trump is expected to issue a trade decision that could make or break the U.S. uranium-mining industry with implications for southeastern Utah, where idled and abandoned mines still dot some of the world’s most beautiful desert landscapes. At the request of two U.S. producers, the Trump administration is weighing whether to require the nuclear power industry to secure up to 25 percent of its uranium from domestic sources. Such a move would make mining near Grand Canyon National Park and Bears Ears National Monument much more likely, say critics such as Amber Reimondo, energy program director of the Grand Canyon Trust. Domestic uranium producers supply less than 5% of the 50 million pounds used annually in the nation’s 99 nuclear plants, while about half that demand is fed by countries whose interests don’t align with those of the United States and who aggressively subsidize their industries, according to the quota proposal advanced by Energy Fuels Resources, a leading uranium producer with operations in Utah. Uranium oxide, known as yellowcake, is selling for about $25 a pound, while on average the cost of production is around $40. The U.S. industry, which has shed about half its workforce in the past two years, is barely surviving on long-term contracts that are to expire soon and could be reset at lower price points absent trade relief, according to the petition. Energy Fuels, which operates the nation’s only uranium mill in southeastern Utah, joined Ur-Energy last year in filing a petition under Section 232 of the Trade Expansion Act, which authorizes such quotas on the basis of national security. The Commerce Department has been studying the proposal for nearly a year, and Commerce Secretary Wilbur Ross submitted results Monday of an “investigation into the effect of imports of uranium on the national security," the department announced. The White House has 90 days to take action on the confidential recommendations. “The potential financial impact of this proposal on U.S. consumers is negligible and a reasonable price to pay to ensure the survival of an industry that is essential for U.S. national security,” states the petition, which also seeks a “Buy American" policy for federal agencies that use uranium. The Grand Canyon Trust worries that the expansion of mining unleashed by the quota would put intense political and economic pressure on the Interior Department to lift a long-standing uranium-mining moratorium on about 1 million acres surrounding Grand Canyon National Park. Under a 25 percent quota, the price of uranium would more than double by 2022 to about $50 a pound and increase annual U.S. mining revenues by $150 million to $700 million, the petition states. Domestic production would jump to about 11 million pounds a year, far more than the 1.4 million produced now. “If we do get relief, that could change our business overnight," Energy Fuels CEO Mark Chalmers said at an investors conference last year. Besides its mill at White Mesa outside Blanding, Energy Fuels has several permitted mines ready to produce within six months, including the La Sal and the Daneros mines in San Juan County. White Mesa produced 380,000 pounds in 2017 from “alternate feeds,” typically waste from federal nuclear sites, and another 950,000 pounds on behalf of other miners, Chalmers told investors. At the $40 to $50 price, Energy Fuels’ annual production target would be 2.5 million pounds. A typical nuclear reactor consumes about 500,000 pounds a year. Chalmers and Utah officials previously had pressed the Interior Department to shrink Bears Ears monument, citing national security concerns similar to the ones raised in the quota petition. In late 2017, Trump ordered the 1.35 million-acre monument designated the year before slashed by 85 percent, carving out areas covered in mining claims. 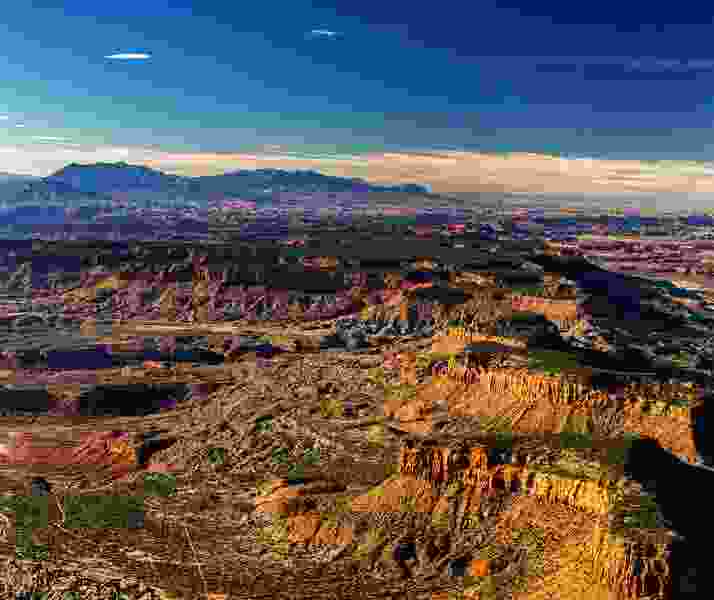 Energy Fuels or companies it controls hold stakes in a majority of the claims near or around Bears Ears and Grand Canyon, according to an analysis by Grand Canyon Trust. Around the same time, the Interior Department included uranium on its list of 35 “nonfuel” mineral commodities that are essential to national security. The nuclear power industry is also pushing back against the quota, arguing it could speed the retirements of many nuclear plants, costing jobs and raising utility rates. Fuel costs for nuclear plants would rise by at least $500 million and as much as $800 million, increasing the cost of electricity by up to $1 per megawatt hour, according to a report commissioned by the Nuclear Energy Institute. It rejected Energy Fuels’ assertion that U.S. uranium mining is in decline, the essential premise supporting the quota proposal, arguing the power industry has long relied on foreign uranium. During the past 25 years, while nuclear plants consumed a steady 50 million pounds a year, U.S. mines have supplied between 2 million and 6 million, without an apparent long-term trend, according to the institute’s report. Chalmers contends his company is poised to meet that expansion, pointing to its mines and mill on the Colorado Plateau.